AdvancedTCA, ATCA (Advanced Telecom Computing Architecture) is the latest standard for carrier grade switching systems developed by the PICMG (PCI Industrial Computers Manufacturers Group) organization. The AdvancedTCA telecommunication system standard has the most extensive input of any architecture standard to date and is being backed by more than 100 companies including many of the large players such as Intel, Lucent, and Motorola. The advantages of designing a standardized chassis are quite well known. Different components from different vendors can be tied together and are guaranteed to operate. In addition, common components can be used in several different systems without the need for re-design. But once you decide that you are going to design an ATCA compliant framework, how do you cool it? The ATCA specification has addressed cooling telecommunication components, at least at the architect’s level. 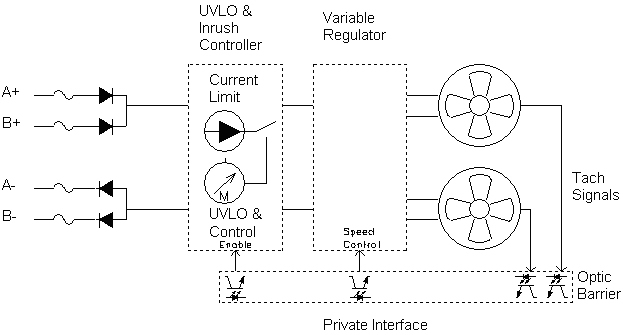 There are two general compliant approaches to an ATCA compliant fan control: the first is an Intelligent FRU (field replaceable unit) which means that the fan control would be directly connected to the IPMB (intelligent platform management bus); the second is a Managed or Non-intelligent FRU. Regardless of how the fan control speed functions are implemented, the fan control must manage 34 – 76 VDC input voltage range, undervoltage lockout, inrush control, and diode isolating of the dual supplies in order to be compliant with the fan control speed requirements. An Intelligent FRU communicates directly to the shelf manager through the IMPB dual I2C bus. This allows the fan tray to use the communication bus that is already present, so all the hardware that is required on the system manager side is already available and nothing needs to be added to support fan control speed. Fan control commands are also determined so standard interface software can be used. However, because the fan tray is connected directly to the IPMB, it has a more extensive list of requirements. 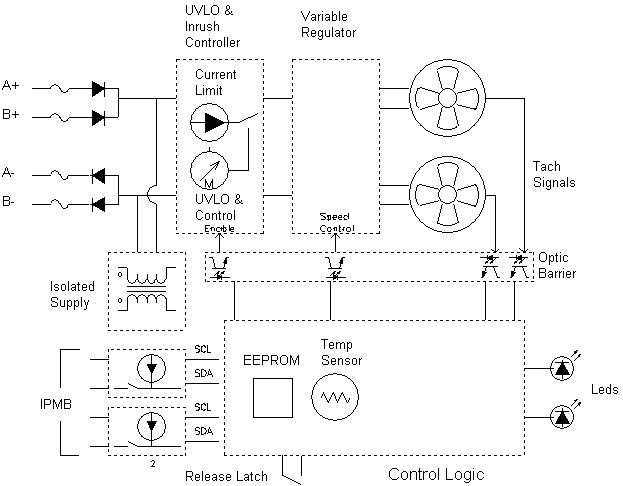 The fan controller must request to be disconnected from the system and provide all the mechanical and physical interfaces to achieve legal hot swap states. This includes mechanical latches to signal removing the tray, as well as the standard blue LED to indicate when the tray is ready to be removed or is active. The tray must also remain in low power state until the system has activated the controller. Another requirement is the addition of hardware and software to manage the dual I2C busses. This requires an on-board isolated supply to power the circuitry, a buffered dual I2C bus with risetime accelerators and tri-state capability. The I2C controller must be able to support a multi-master I2C dual bus and handle the standard set of fan commands outlined in the protocol. In addition, on-board temperature reporting, tray capability reporting, fan turn-off capabilities, and non-volatile storage are required. A sample implementation of this approach is shown in Figure 1. The main advantage of using this design approach is the ability to leverage designs against each other. Common hardware and common software can be used in several different systems with widely different cooling requirements by simply setting constants to indicate the fan tray’s capacity. Therefore, design time can be decreased, the same tray can be used by different vendors, and one system can use fan trays made by different vendors. Also, as mentioned above, no additional hardware in the system is required to communicate with the fan tray; however, a considerable amount of hardware in the fan tray is dedicated to handling the IPMB requirements. A Managed FRU fan tray could use virtually any existing fan tray and integrate it into an ATCA chassis. The fan tray controls the fan speed and power regulation, while another component in the system manages communication with the rest of the system and inventory information. The advantages of such a design are: fewer communication requirements, which can lower cost; the ability to use fan trays from existing designs; and, allowing the fan tray to be customized outside the ATCA specification for the specific requirements of the chassis. The only set requirements become handling the input voltage range of 34 – 76 VDC and related features, and having another component in the system to maintain inventory data. A sample implementation is shown in Figure 2. The power and regulation sections of the fan tray are basically the same. It is the control section that is different. While a much less complex control and interface section is required, the system must have specialized hardware to interface to the fan tray. Some data would need to be reported as not available or gathered outside the tray. A separate temperature sensor would be an example of how this could be done. 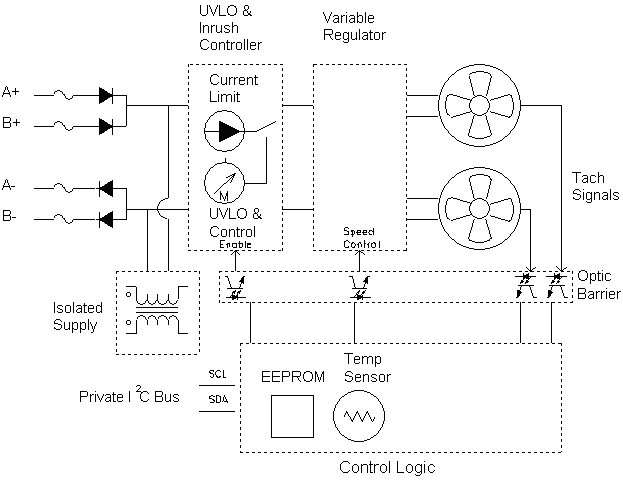 Another approach could use a single private I2C bus, as shown in Figure 3, which could give nearly all the features of the IPMB implementation of Figure 1 with less fan controller hardware and firmware but added system hardware and software. This system could even store the inventory and capabilities data in its own EEPROM, but another controller would need to access the information because it would not be available on the IPMB. As with any engineering challenge, designing the cooling interface of an ATCA chassis is about weighing one advantage against another to give the best system performance. There are performance and cost advantages to either approach above. While in one system it may be infeasible to add a separate communications bus to the fan controller, another system may have an un-utilized private bus and overhead available to manage the fan tray. About the author: Nathan Lavoie has a BSEE from the University of Vermont and is the Vice President of Engineering of Control Resources Inc., a manufacturer of off-the-shelf and custom Fan Trays, Fan Controls, and Alarms.